OTTAWA, Ontario (CNS) — Recalling the words of St. John Paul II, Ottawa Archbishop Terrence Prendergast called upon Canadians not to be afraid in the wake of the Oct. 22 shooting that left a Canadian soldier dead and forced lawmakers to barricade themselves inside their parliament offices. “These words apply most appropriately to this present moment in our life in the nation’s capital, but they speak also to all Canadians,” the archbishop wrote. Authorities said a gunman killed Cpl. 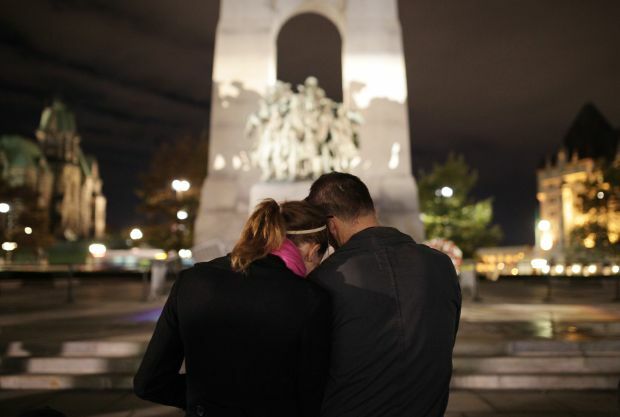 Nathan Cirillo, a member of the army reserves from Hamilton, Ontario, who was guarding the tomb of the unknown soldier at the National War Memorial blocks from parliament. The assailant, whom police identified as Michael Zehaf-Bibeau, made his way to the parliament where he fired multiple times before he was shot and killed. “God is still the Lord of our lives and is at work in the hearts of the bystanders who attempted CPR, called the police and other first responders who showed themselves courageous in putting their lives at risk in a moment of crisis,” Archbishop Prendergast said. “We have much to be grateful for. To live with moral certitude is to presume people mean me/us well and we should live out of that conviction. ” And while remaining alert to signs of behavior that can be harmful, we need to go about our business as the friendly and welcoming people I have come to know Ottawans to be,” he said. The morning of the shootings, Archbishop Prendergast was in Blessed Sacrament Church in Toronto celebrating the funeral of a friend when he first heard the news. “As I went back to the sacristy, someone mentioned that there was a terrorist action going on in Ottawa in generic terms, that much of Ottawa was on lockdown and that I should check to see whether I could fly to Ottawa in the afternoon,” he said. He was planning on an afternoon flight to he could host his annual Archbishop’s Charity Dinner that evening. More than 700 tickets had been sold. The archbishop and his staff decided to cancel the dinner in the wake of the shootings. He said the food that had been prepared was delivered to the Shepherds of Good Hope for distribution to Ottawa’s needy residents. In a press release announcing the cancelation, Archbishop Prendergast offered prayers for the victims. “Let us offer our prayers to God in support of those who have been most affected by today’s events. As we do, let us also thank God for the beauty of our country and for the blessings of peace and security which are the blessings bestowed upon Canadians,” the statement said.